Scentsy Consultants: Here are 50 tips to help you earn 200 PRV. Remember, a qualifying party consists of 200 PRV points. It’s also the amount of PRV points required each month to stay active*. You need to be active with 200 PRV at least once in every three consecutive months to remain a current consultant. It’s not cumulative over three months; and it’s not required every month. Think: Have a qualified party once every three months. In the United States $1 generally equals 1 PRV. Ask your sponsor for the few exceptions or the formula if you’re in a country other than the U.S. This is not a difficult requirement, especially if you work some of these tips below. You don’t need to sell Scentsy, merely share it with others. If you do that, you’ll not have a problem achieving 200 PRV. 1. Host one qualifying party (remember a qualifying party is at least 200 PRV). 2. Sell six 6-packs. Use themes like Freshen Your Spring Scents, Bring Back My Bar, or Celebrate Summer Scents. 3. Do a poll for favorite discontinued scents and, based on the answers you receive, suggest new scents that are similar to their old favorites. 4. Provide outstanding customer service. Great customer service will get you 200 PRV every month without having to ask for sales. If you make sure your customers have the very best experience, they will come to you with new orders; those add up quickly! 5. Follow up. When a customer orders a new scent, chooses a product they’ve never used before, or simply has an order direct-shipped, call within a week to ten days to check on them. This is often a good time to talk about their wish list and perhaps book a party. 6. Promote Scentsy specials. Specials are a great reason to connect with past Hosts as well as past and current customers. It won’t take long to get 200 PRV in orders. 7. Let Host Rewards do the work for you. Call every past Host to let them know what they could earn from a qualifying party. 8. Have a Host of the Month Club. Find 4 people who commit to purchase 50 PRV in product per month. Make a schedule designating each person the Host for four months out of the year. Every month you would have one 200 PRV party and you’d have four happy customers who get to be the Host four times a year without too much effort on their part! 9. Post that you are getting ready to send in an order in three days and would be happy to include their order with yours. Let customers know about new fun products available now. Refer them to your PWS for contact information. 10. Be your own best customer. One Consultant shared, “I just ordered Washer Whiffs and hand soaps as I always keep those items in my cupboards. I used to buy gallon jugs from Costco; now I buy from myself.” The good news is, you not only save on shipping but you earn commission on your own order. 11. Work to get four 50 PRV orders. A few phone calls, a little follow up, and you’re on your way! 12. Change the way you purchase for personal use. Think about placing an order for everything you need for personal use only once every three months instead of a little each month. Chances are you will have at least a 200 PRV order. Remember you’ll save on shipping AND get free product. 13. Sell four NCAA collegiate football helmet warmers. Be sure to check the workstation for licensed product marketing guidelines. 14. Have an open house. 16. Give Hosts two catalogs and five order forms. Tell each one if she has $100 in orders she gets any warmer at half-off. If two of these are successful, you have your $200 for a party, one half price item and one Perpetual Party Reward for the Hosts, $20 free product and probably four to six new customers! Note: This should be part of a Host coaching process. It may not be posted in a forum, social media, or otherwise advertised. 17. Talk to a day spa about our Scentsy Diffuser and Essential Oils. The quality of our diffuser and our oils are a natural fit for spas. Leave one in a salon for a week to let your customers try them out. Don’t forget to tell them about the enhanced limited lifetime warranty. 18. Pick up the phone. Make three calls about your business every day. It can be customer/order follow up, calling your list of 100, letting customers know of new products, or following up on leads. But if you do this consistently, you will sell product and book parties. 19. Sell three Perfect Scentsy packages (two$30 warmers and six candle bars). This represents great savings and is a good topic for those three calls you’re making every day. 20. Use Scentsy Skin for party favors or birthday gifts! You can mix and match fragrances and products to create kits and packages. 21. Just ask. 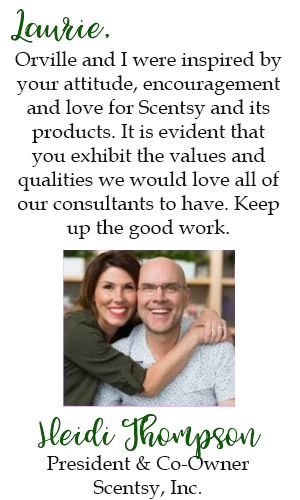 Start by talking about Scentsy and asking for the sale or at least offering a scent sample. Follow up quickly on the scent sample. The more people you talk to, the more opportunities you have to sell Scentsy! It won’t take long for 200 PRV to become routine. 22. Find four people to use our Laundry Love bundle. 23. Give Scentsy as Host gifts when you go to a party. Never go empty handed. Scentsy is better and lasts longer than a bottle of wine or a pie. 24. Have an open party on your PWS. This can be a standing party. Post the link to your social media sites. Close the party and open a new one at least twice a month so hosts are not waiting long for their orders. All customer orders placed online will be direct shipped. 25. Call your customers until you have collected five referrals. Follow-up with the referrals with a view to sell product or book a party. 26. Use old fashioned communication – one on one voice via telephone or in person. It’s too easy for people to ignore you or say no when you’re communicating digitally. This business works best when you build relationships. 27. Brand your car with a car vinyl. 28. Be ready. Have some items on hand in your “mobile office” so you can sell on the go. Collect orders while you sit in the bleachers at your child’s game. Give the women at your bank a catalog. Hand out a business card and sample to a waitress or drive-through attendant. 29. Create a Facebook customer group. Stay engaged with your customers. 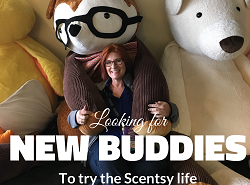 Offer simple tips for an excellent Scentsy experience, update when new products come out, post specials. Note: Be careful to only post corporate sponsored promotions. No personal specials or selling of inventory can be done in groups. Even private groups are considered public for Scentsy advertising policies. 30. Mail past customers the Scent of the Month flyer with a scent sample. Break up the customer list so you can afford to do this monthly. Even if you only send 15 a month, you will start to see orders come in. 31. Invest in a set of mini-testers. Get one, two, or three basket parties out there working for you. 33. Set up a fundraiser. When your orders come in, remember to label all product with your contact information to encourage repeat orders. 34. Call ten different customers each day for a week. Simply ask if they would like to try any of the new spring/summer fragrances. 35. Invite all of your past Hosts to a “Host Appreciation” event at your home. Express your appreciation for them, talk about new opportunities, explain Scent or Warmer of the Month and offer them a chance to book a party. 36. Host a “Mystery Host” party. This is like hosting your own Open House, except you let all your guests know that if they make a purchase, they will be entered into the Mystery Host drawing. At the end of the party, choose one name from the bag and that person gets to collect the Host Rewards from the party! You can choose to set a minimum spending limit for entry. For example: they must spend at least $50. This helps ensure you will get at least the 200 PRV needed to make it a qualifying party. Note: You may do this at a party, but you may not post or advertise this as a reason to come to the party. 37. Be your own best customer when it comes to gift giving. Babies, birthdays, and holidays are all great reasons to give a gift! 38. Talk to brides! During the slower summer months, focus on weddings. Suggest warming fragrance at the reception, as gifts for the bridal party, or a honeymoon package for those special “in the room” moments. Suggest Scentsy for rehearsal dinner, shower, honeymoon, or house-warming gifts. 39. Have a Scentsy bridal shower. Have the bride create a wish list, then share her list with those attending the shower. 40. Subscribe to the Warmer of the Month (60 PRV), & collect four 35 PRV orders. 41. Sign up for a small Scentsy Fragrance vendor fair. Use Combine and Save options to buy supplies for your fair. You can have a great display for 200 PRV and you will get free shipping, free and half-price products, and earn commission on your purchase. 42. Focus on high school and college grads. Promote the Make a Scene warmer for the gift giver to customize with school colors and mementos. 43. Contact local businesses with lots of employees in a small location (real estate offices, dental offices, medical practices, schools, etc.). Ask them if you can do a quick lunch time demo for their employees one day. Offer them the Host Rewards if the staff purchases enough to make it a party. 44. Host a Scentiversary party. It’s like a launch party. Invite all your customers, family, and friends to come celebrate the occasion and see the new Scentsy family products! 45. Create a system for customer follow-up. Put all customer order forms in a binder organized by month. Each month, flip three months back in the binder and call five customers a day to see if they are ready to reorder. By the end of the month, you will have contacted approximately 100 customers and are bound to have gathered 200 PRV in sales. Be sure to enter orders at least twice a month. 46. Make a simple flyer to include in your deliveries or to hand out with business cards or catalogs. Showcase simple Scentsy gifts that can be given to teachers on Christmas, their birthday, or at the end of the school year. Suggest gifts that range in price from $5-$20. If 20 people buy a 10 PRV gift, you will reach your 200 PRV. Set your gifts apart by wrapping them or including a cute tag to go with the gift. 47. Promote Combine and Save. Let party guests know that if they purchase a Scentsy “Combine and Save” warmer system, they will be entered into a drawing for a special warmer. The prize will be awarded at the end of the month. Again, please note: this can be announced at a party, but may not be posted to Facebook or advertised in any other way. Use the Combine and Save bundles properly. They’re intended to upsell – to give the customer an additional savings by buying a bit more. You’re hurting your business if you’re promoting them as a discount without purchasing more. 48. Throw a Mother/Daughter Spa Party. How about a Scentsy Skin party featuring the new fragrances? With eight people at you party placing orders totaling 25-30 PRV each, you’ll easily reach 200 PRV. Offer wine and virgin strawberry daiquiris. 49. Provide “Off to College” Ideas. Make up examples of gifts to give new college students to spark ideas: Sleek White Warmer with inspirational saying instead of photo; Skin or Groom gift bag arranged in bathroom organizer (with cotton puffs, loofah, etc. ); Washer Whiffs and Dryer Disks with roll of quarters and a stain stick in a laundry basket; Collegiate Warmer with 3- pack of bars. You can do this as a home party, open house or even a basket party. 50. Have a Scent Circle Fundraiser. Seek out schools, sports teams, school clubs like band or cheerleaders, explain the value and ease for the organization, and you can easily be at 200 PRV for the month. *This change from 150 to 200 PRV was effective March 2017.